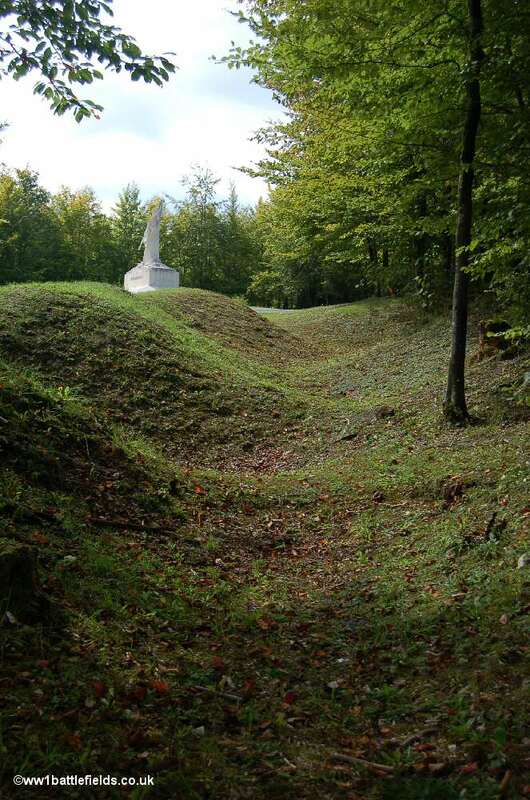 Although perhaps a less visited area (except for the striking memorial at Mort-Homme), the west or left bank of the River Meuse has many sites of significance and interest. This page covers just a few of them. On the D18 road about ten miles north-west of Verdun is the site of Haucourt, one of the villages destoyed in 1916, although there are still farm buildings here toay. 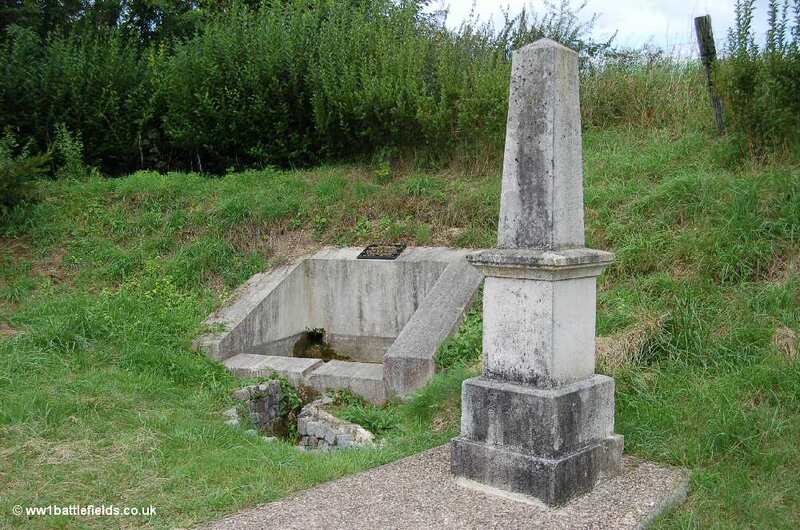 There is a memorial constructed on the remains of a blockhouse, located on the left hand side of the road as you travel south. The plaque on the front of the memorial blockhouse shows that it is in memory of six companies of the French 69th Infantry Regiment who disappeared entirely between the 30th of March and the 5th of April 1916, whilst engaged in defending Haucourt and the nearby village of Malancourt. It is also in memory of their 'brothers-in-arms' of the 79th US Infantry Division, who fell here later in the war, in September 1918. Continuing south from Haucourt on the D18, in a quiet area, located on a road leading off to the left is the monument at Hill 304. 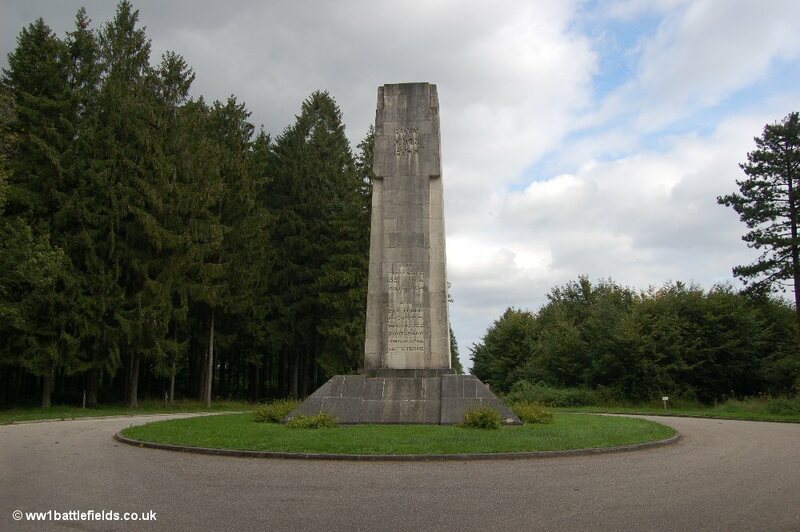 The monument is at the end of a long straight road lined with trees, and the road ends by encircling the monument; it does not lead any further. Hill 304 (Cote 304) was first attacked by the Germans on the 20th of March 1916, and then again on the 9th of April. Neither of these attacks were successful, but following further efforts in May, the summit of the hill was finally taken on the 29th of June. Just under two months later, the French reclaimed it. On the sides of the memorial are listed the Divisions which fought here in 1916 (on the right side) and in 1917 (on the left side). 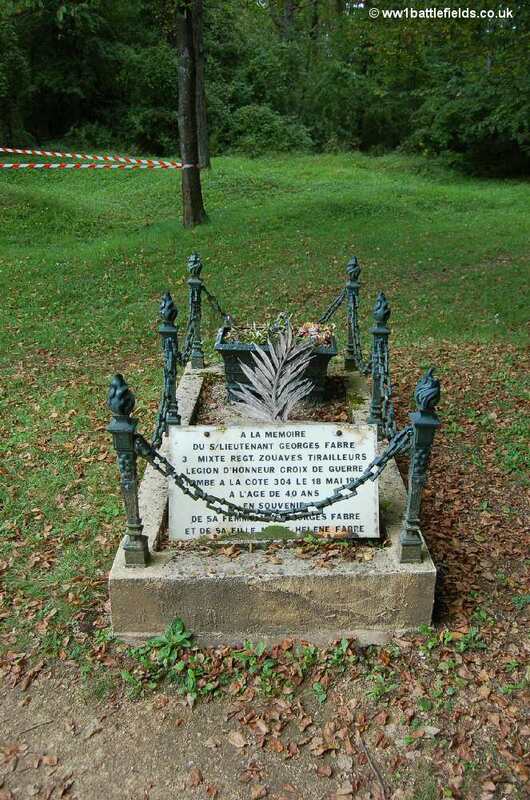 Just to the left of the memorial is the tomb of Lt Georges Fabre, who died on the 18th of May 1916. A short walk from the left of the monument is the site of the German front line, where the outlines of trenches can still be seen, and there were also some shells lying here when I visited. Returning to the D18, this road continues south and then joins the D38. Turning left , after about three miles is another left turn that leads nothward towards Mort-Homme. On the right side of this road is a fountain commemorating Capitaine Lemoelle. The plaque records that he fell gloriously at the head of his Company on the 16th of March 1916, when he attacked Corbeaux Wood shouting 'Forward'. The road leads on to Mort-Homme, which was a small hamlet before the war. Again, this road lends at the site, but there are parking spaces here, and quite a lot to see. There are information boards giving details, and showing photographs of the site here as it was shortly after the war. 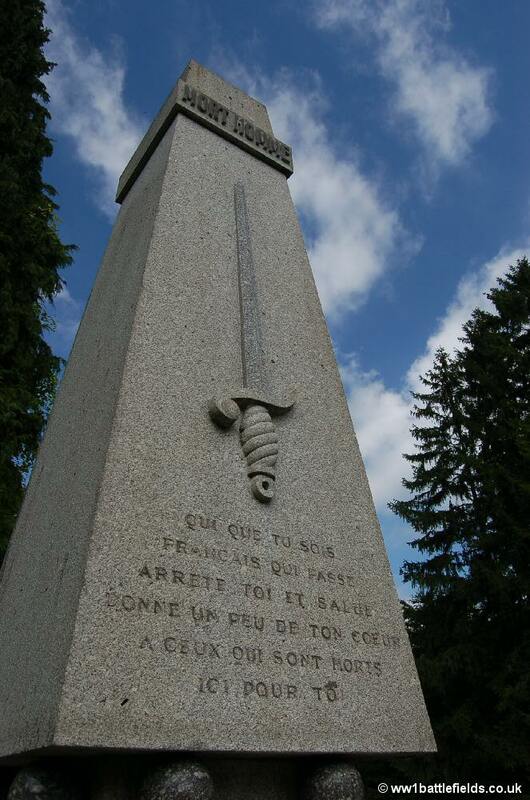 There is a memorial to the men of the French 40th Division, in the form of a tall obelisk with a sword engraved on the front and the words Mort-Homme inscribed on the top. 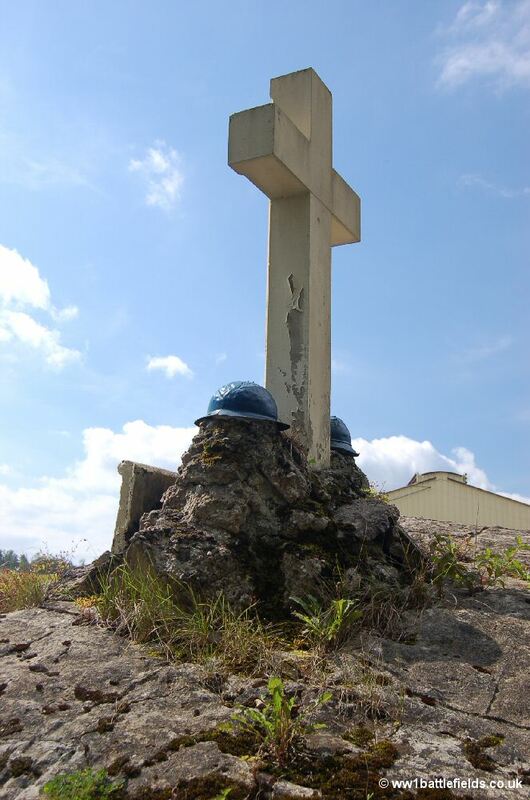 One of the old pictures on the information board shows this memorial standing tall shortly after the war, in a wasteland of ravaged land, craters and trenchlines. 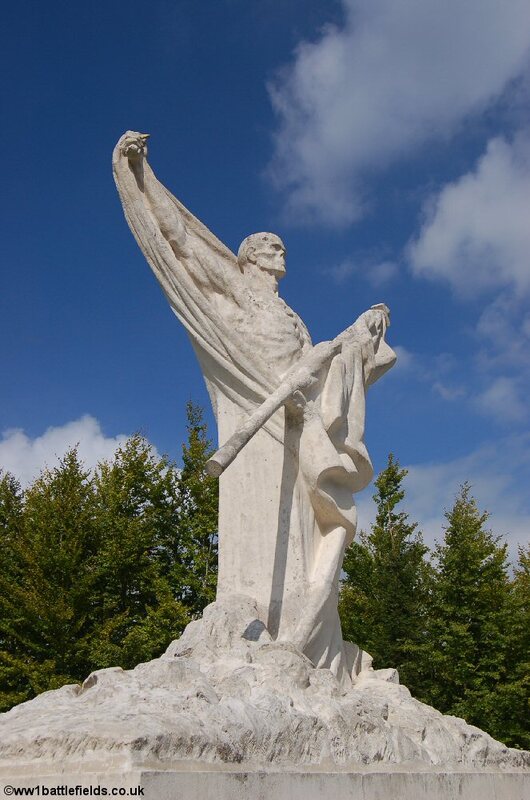 There are also the remains of trenchlines in the trees nearby, but without doubt the most striking and well-known feature here is the main Mort-Homme monument (see below). Because the peak itself was so badly damaged, instead tunnels were built under the surface, with narrow gauge railways to supply the troops. Fighting continued here from April 1916, with the French launching repeated offensives in the months that followed. However, it was not until August of 1917 until the area was retaken, with the Germans trapped when a large mortar bomb destroyed the northern exit of the tunnel. Also located here are symbolic wooden and stone crosses, remembering both the Germans and the French who died on this blood-soaked hill. The famous Mort-Homme 'Skeleton Memorial' commemorates those of the 36th Division who fought and died here. 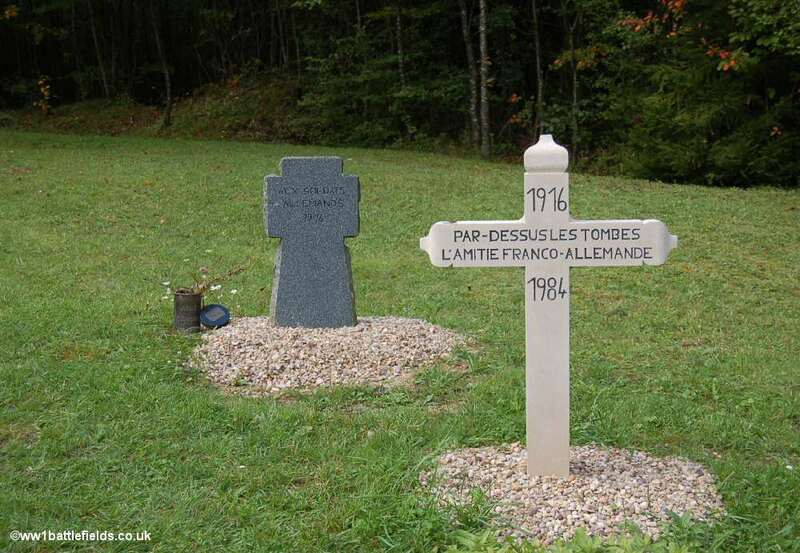 It is estimatd that 10,000 Frenchmen lost their lives here. The memorial, by Froment-Meurice, was unveiled in 1922, and the information boards show contemporary pictures of it. 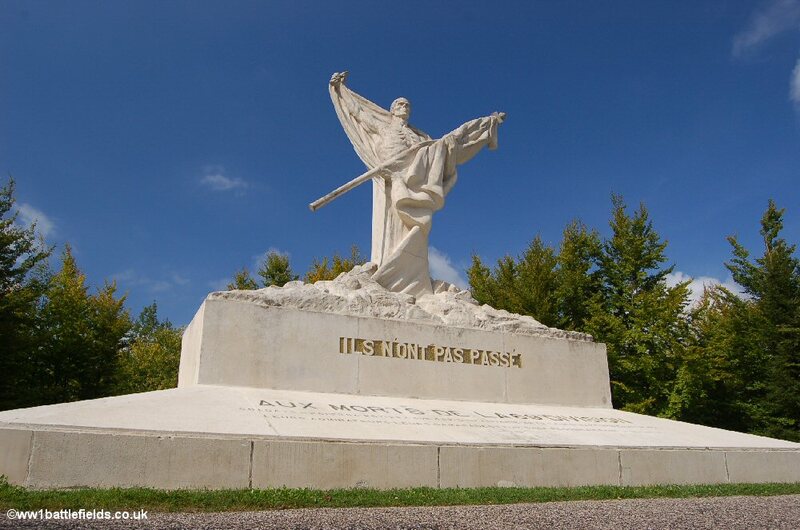 On the front is the famous phrase "ils n'ont pas passe" (they did not pass), which came to represent the need and desire of the French to hold onto Verdun. On the plinth of the memorial, officers are listed by name, but there are simply lists of regiments to remember the rank and file soldiers who died. Returning to the D38 and travelling east, the D123 leads off in a northerly direction after another mile or so. On this road is the site of Cumieres, another of the villages destroyed during the fighting. In 1911, there were 211 inhabitants of the village. 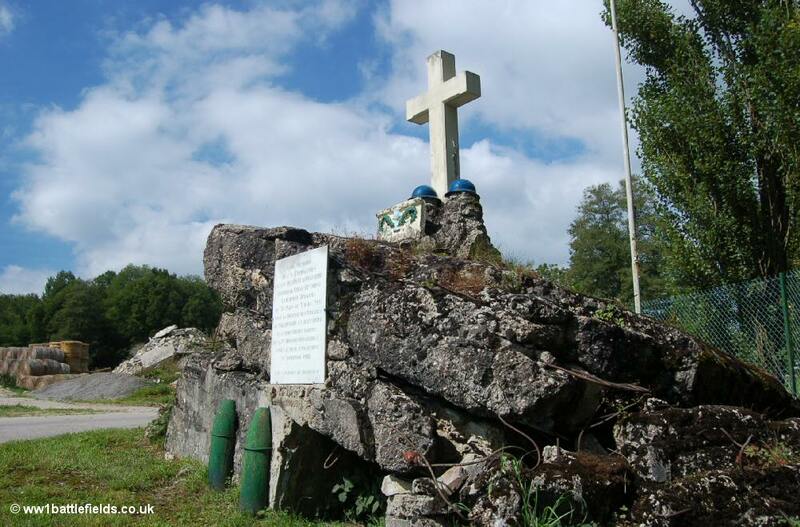 As with other sites near Verdun there is some detailed background information available on signboards in three languages, and also poignant photographs of the village as it was before the Great War. The civilian population of the village was evacuated on the 12th of February 1916. The village was involved very early on in the War, when on the 5th of September 1914 an Uhlan arrived here from the village of Forges (to the north). He was taken prisoner, but tried to escape, and in doing so was killed. He was buried in the village graveyard. Raids continued in September 1914, and the Mayor was taken hostage and taken to Germany on the 17th of that month. 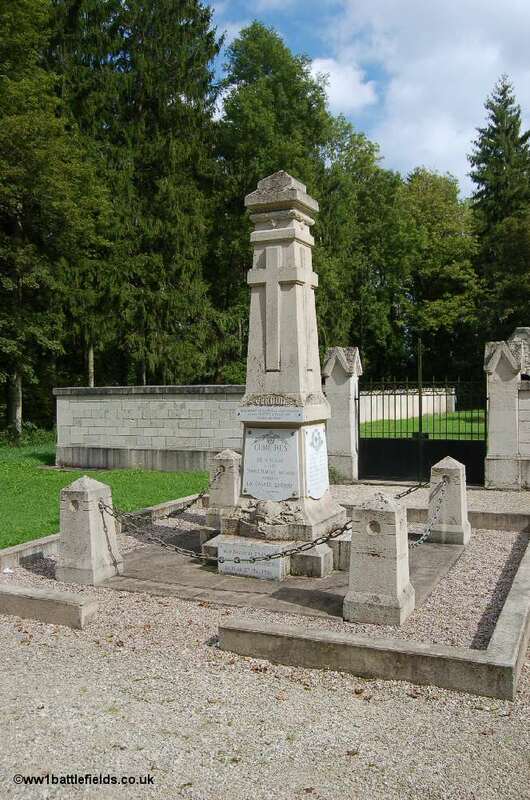 The memorial at Cumieres has several commemorations: on the base it remembers the heros of the 254th Infantry who defended Cumieres between the 16th and the 23rd of May 1916. The central plaque commemorates the village, and the names of those villagers who fought and died during the war can be found on the sides of the memorial. Above the central plaque, the recapture of the village by a regiment of the Foreign Legion on the 20th of August 1917 is noted. 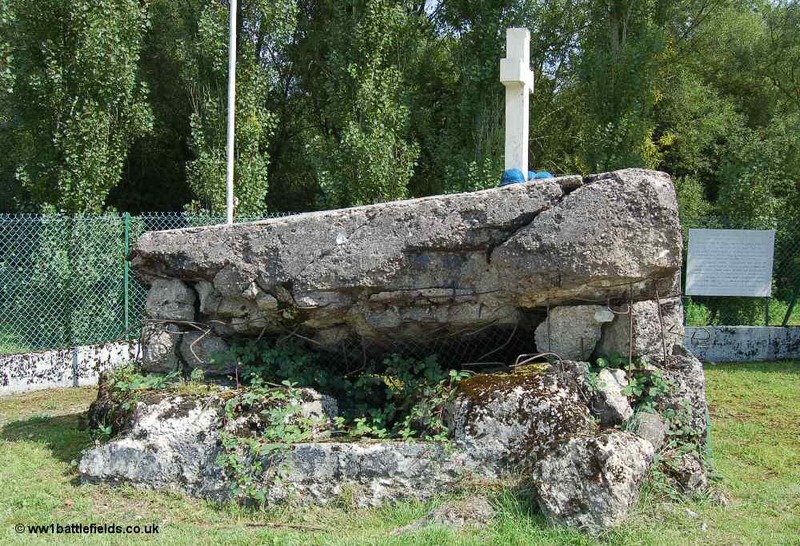 The site of Forges, the village from which the Germans attacked Cumieres in the early days of the War can be found a little further to the north. 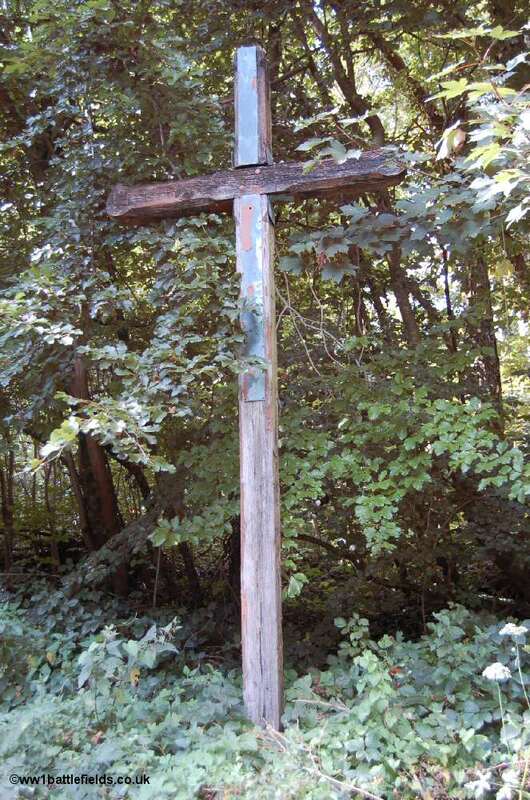 Here, several wooden crosses were erected after the War to mark the site of the village. One of the wooden crosses is still visible just on the D160 road at the rear of a turning area.